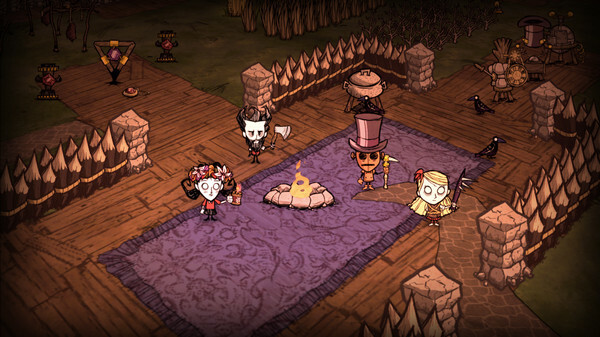 Prepare to fail at survival, as Don't Starve Together is officially being released this month on the 21st of April. Great game, do try it out. Quote We don’t have any concrete plans right now. Shipwrecked was built without DST in mind, and we’re going to need to evaluate how much is needed if we were going to do this. We would all love to go sailing with our friends! Quote the first step of it is coming to you at Launch: we’re putting in small variations to the basic biomes so that every generation feels a bit different, and these will transition over time as you play through the seasons. See the developers announcement here. Does it use some server, or it can be played over LAN? Shmerl Does it use some server, or it can be played over LAN? It supports online and LAN multiplayer with steam integration. It also has offline mode which, obviously, only gives you access to LAN multiplayer. Thanks, that sounds good. So it won't be tied to Steam? I appreciate when developers provide LAN / WAN multiplayer when one game instance simply runs in server mode. Many developers don't put much effort into that, and simply tie their games to Steamworks for network features. i appreciate when it is tied to steam instead. everything neat and tidy in one place. sweet stuff!... i mean common.... nobody (almost) plays via LAN anymore. Nobody or not nobody, it doesn't matter. Not only it's not tying you to Steam, having the local server option allows playing the game no matter what server exists out there. Too many old games go bust in regards to multiplayer after their servers die. That's not a good thing. You don't need to use LAN. You can use WAN all the same, if the server component is part of the game and allows running it in server mode. Anyone know if it supports local co-op play? I generally play games with my brother that way, since his computer is too old to play most games these days, plus you only need one copy of the game. Not that I don't already have several copies of this game, but I would love to play it locally with split screen. @slaapliedje: you mean on the same computer? I do hope it has local co-op and LAN, I am much more likely to use those options..
Side thought, I know nothing about the Steam API, but I wonder if it could have a LAN-only fall back built in (or how hard that would really be). pr4vus i appreciate when it is tied to steam instead. everything neat and tidy in one place. sweet stuff!... i mean common.... nobody (almost) plays via LAN anymore. Please don't generalize to such a degree. I live in an area with rotten Internet access. LAN is the only way for me to play any non-local multi-player game. There is no official local co-op (splitscreen or shared screen) but you can host LAN games without an internet connection. Also, this game literally runs on nothing (I've run it on a laptop with 1.2GHz Pentium dual-core and 32MB shared video memory D: haha). And I guess if you used port forwarding you could host an internet game using the LAN feature, as opposed to hosting through Steam (the way it works with the dedicated server).